Hot water boiler heating is the cleanest and most economical way to heat your home. Berks Energy has years of experience installing and servicing gas and oil fired boilers. A new boiler offers environmental and safety advantages. Using less fuel and producing fewer toxic by-products of combustion, new boilers reduce the risk of carbon monoxide exposure within the home or business, and contribute to a cleaner external environment for us all. Contact us today to save money and live in comfort. Not sure if you should repair or replace? Well, consider this: if you’re operating an inefficient system that breaks down a lot, it’s likely that it’s going to break down again. That means more expensive emergency service calls or possible damage to the other components of your heating and cooling system. Also, consider the ongoing cost factor. You could save up to 60% on your energy bills with new high-efficiency equipment. You see, even if your air conditioner is only a few years old, it could be terribly inefficient by today’s energy efficiency standards. In stalling a new, high efficiency cooling system can actually pay for itself in energy savings within a relatively short time. Do you have problems cooling or heating certain spots in your Berks County home? Are noisy, drippy window units getting you down? Does your home lack the ductwork necessary for central heating and air conditioning? It sounds as if a split-ductless system is the solution for you. Popular for many years in Europe and Asia, split ductless systems are fast becoming just as popular in the United States. Sanyo air conditioners and heat pumps are the perfect solution for your home or office. Sanyo units come in three configurations that will suit any of your hot and cold spot needs. The Sanyo system can cool and heat your sun room, basement or addition effectively and efficiently. The can be installed in areas that are not accessible with conventional duct work. At Berks Energy we have preventive service plans to ensure that you won’t have to replace your air conditioner. And if you do, we will make sure that it is installed correctly. If you are looking for an air conditioning contractor in Berks County please call us today at 484-797-3456. When the temperature heats up outdoors, you depend on your cooling system to keep you cool indoors. Talk to our professional air conditioning contractors today about our selection of quality air conditioning systems and our professional installation services. Most homeowners wish that the gas furnace in their home would last forever. And that wish could be granted when you install an Amana® brand gas furnace. The complete line-up of Amana® brand gas furnaces offer what many conclude are the best warranty programs in the heating and cooling industry. Several furnace models offer variable and multi-speed performance. This provides enhanced indoor comfort by slowly ramping up to your thermostat setting rather that simply ting at full speed. This alleviates the ‘cold airblow’ often associated with single-speed furnaces. To find the highest level of energy-efficient gas furnaces, look for the highest AFUE rating. Amana® brand heat pumps provide both cooling and heating comfort from a single system. 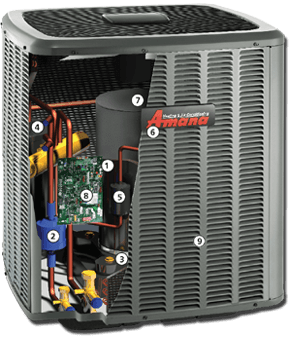 You’ll be able to select the perfect system for your home as the Amana brand offers a full line of heat pump systems. Plus you’ll get even more comfort from what many consider to be the best warranty protection in the heating and cooling industry. For the greatest energy efficiency savings, select a heat pump system with the highest SEER and HSPF ratings. Learn more about Amana brand heat pumps. As the innovative manufacturer behind the world’s first walk-in cooler and the Radarange microwave oven, the Amana brand has long been an American institution. And the same commitment to quality and innovation behind Amana brand home appliances goes into Amana brand heating and air conditioning equipment. In fact, the Amana brand is the standard-bearer for gas furnaces in the HVAC industry, thanks to its proprietary MillionAir® heat exchanger and Suret™ igniter. And when the temperature heats up outdoors, Amana brand comfort systems are ready with a high-quality line of air conditioners and heat pumps that are among the most energy-efficient in the marketplace. Add to these high-quality products some of the industry’s best warranties and you’ll know why the Amana brand has stood for innovation and dependability for almost a century. With Lifetime Unit Replacement Limited Warranties on the heat exchangers in all Amana brand gas furnaces and the compressors in many Amana brand air conditioners and heat pumps, you can be assured of our products’ long-lasting performance. For further peace of mind, we offer an extended service protection plan called Asure to provide you with value-added labor and parts coverage. All Amana® brand high-efficiency units feature scroll compressors offering lower sound ratings compared to reciprocating compressors. Scroll compressors also contain up to 70% fewer moving parts. 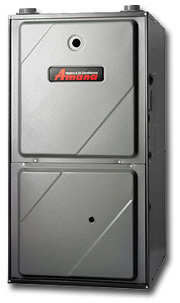 Amana brand energy-efficient models use a mix of scroll and reciprocating compressors optimized for the application. The factory-installed crankcase heater is wrapped around the base of the compressor and provides multiple functions. When the heat pump is shut down in colder ambient conditions, the crankcase heater reduces liquid refrigerant migration in the compressor shell by keeping the refrigerant at a temperature higher than the coldest part of the refrigerant system. System oil will generally migrate to the warmest part of the refrigerant system. By keeping the compressor warm the crankcase heater helps to keep oil in the compressor where it is needed. Not only does this protect the compressor but noise reduction is achieved by preventing liquid refrigerant accumulation in the compressor shell. Designed to protect the heat pump compressor from the damage of liquid refrigerant flood-back conditions, an accumulator stores excess liquid refrigerant and only allows refrigerant vapor to enter the compressor. Basically, the accumulator acts as a storage vessel. By storing and converting outlet refrigerant to a vapor, the accumulator protects against long-term damage to the compressor commonly called ‘slugging’. Similar to the muffler on the exhaust system of a car, the discharge muffler on a heat pump reduces transient conditions that cause vibration affecting the operational noise of a heat pump. A discharge muffler also helps to minimize the pulsations occurring between the cooling and heating modes of a heat pump. Mufflers on Amana brand heat pumps have been up-sized to minimize noise caused by higher operating pressures associated with the R-410A refrigerant. When the refrigerant charge or pressure in a heat pump system is low, this switch activates and stops the operation of the heat pump to minimize potential damage to the compressor. A heat pump system that is low on refrigerant will not provide adequate heating or cooling. Further, low or loss of pressure can cause freezing of the condenser coil which drastically hinders the performance of a heat pump. This silent guard stands ready to operate only when needed to help protect the heat pump’s compressor from damage. The sound blanket insulates against the normal operating sound of the compressor. But not all sound blankets are created equal. Unless it’s constructed of high-density, thick foam and other materials, it may not provide the same level of sound insulation. This feature helps to increase compressor reliability and reduces the noise level during heat pump systems defrost cycles. When outdoor temperatures fall below freezing and the heat pump is forced to initiate a defrost cycle, SmartShift simply turns off the compressor for 30 seconds allowing the system pressure to equalize and then restarts the compressor. This seamless operation is triggered automatically, eliminating unwanted noise caused by heat pump defrost changeover cycles. Since this refrigerant does not contain chlorine, it is considered to be more environmentally friendly compared to R-22 refrigerant. Introduced in 1995, R-410A has helped to increase the durability and reliability of compressors.